Meter readings and energy-saving notes for dual fuel use at home in 2008. First full year of meter readings and analysis of our electricity and gas carbon footprint at home in 2008. The first round of the grid-tied PV system went in too. 2008 data (kWh: e used 2036, e gen -901, g 8883). See the daily PV generation logs for 2008 as .csv and .png chart. During 2008 gas consumption for cooking and water heating is ~8kWh/day. (From summer when there is no space-heat demand and we are not on holiday.) That totals ~3MWh for the year. This leaves ~6MWh as space heating, with 1061 heating-degree-days @ 12°C, ie about 5.7kWh/HDD12. By contrast, the equivalent for the first 3 months of 2009 is ~3.9kWh/HDD12, which implies 30%--40% improved heating efficiency as previously inferred. And indeed, given that 2008 benefited from efficiency measures at the end, comparing with the first 3 months of 2008 at ~7.4kWh/HDD12 more clearly indicates a near-doubling of efficiency over a year. Our total exterior wall / ground floor / roof area is ~164m^2. So a heating demand of 3.9kWh/HDD12 (162W/K) as at the start of 2009 corresponds to an effective U-value of approx 1W/K/m^2 overall. During the recent air-leakage and SAP investigation one of the parameters estimated was the U-value of the large blank north wall, at around 0.8W/m^2/K, so over its ~40m^2 that's 32W/K or ~0.77kWh/K/day. Or ~0.77kWh/HDD in the terms above, or about 20% of total heat loss. Modern building regs require a U-value of <0.4W/m^2/K, and retrofitting that wall to meet or exceed that would maybe save 10% or 0.6MWh/y in a harsh winter. Similarly improving the other exterior walls (~50m^2 - window area) could save that full 20% or ~1MWh/y, or half my 2009 target. This broadly agrees with the SAP calculations which suggest that ~30% of heat is being lost through the walls currently (including ventilation). Window, ground floor and ventilation losses all tie at about 20%. In general it would be good to exceed building regs by a 'best practice' margin of (say) 25% if it can be done to maximise the return given the disruption. As of our June 2009 holiday the house base electricity consumption, in our absence with essentially just the fridge/freezer and server/ADSL running, was just over 2kWh/day. When I am here on my own (and my family is away) I tend to use about 0.5kWh/day extra. We had a new electricity meter installed 2008/02/11 since the old one might have been unsafe. But the new one was unratcheted and thus ran backwards when we exported/"spilled" to the grid which apparently causes various accounting and reporting traumas. So we had yet another change (to an import/export pair) 2009/09/21! The new import/export meter pair was installed in under an hour. (Unfortunately at solar noon, thus losing a prime hour's generation!) The meters are digital (mechanical rather than electronic). So we now have three digital kWh readouts: generation, import and export. Note that generation - (import + export) is whatever we consume internally. The gas company's estimate of our consumption from 2009/01/02 to 2009/06/29 though a meter change, etc, is 3714.6kWh. My estimate from 2009/01/01 to 2009/06/30 is 3744kWh. Which is pretty-well spot on given the two days' difference. 2008/01 214 (6.9/d) 1418 (45.7/d) 20071231-20:38-GMT to 20080131-20:51-GMT (31d) Gas use >60kWh/day at the end of the month. No microgeneration (other than a tiny off-grid PV system). HDD12=140. 2008/02 195 (6.7/d) -4 (-1.6/d) 1449 (50.0/d) 20080131-20:51-GMT to 20080229-20:06-GMT (29d) Gas use >60kWh/day at various points. Import meter unratcheted thus able to run in reverse, so actual import readings totalling 191kWh shown with the 4kWh of the PV generation meter added back on. 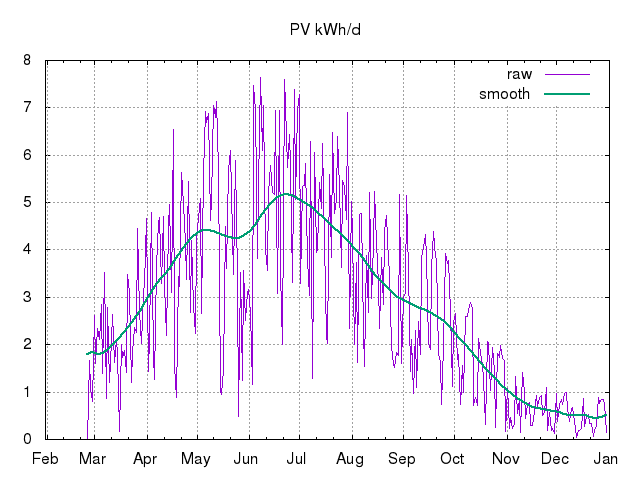 PV system operational for only the last 2.5d approx of the period from 2008/02/27 ~13:00 with first ~0.4kWh missed in the logs (.csv). See the projected outputs from the PV system. HDD12=172. 2008/03 187 (6.0/d) -70 (-2.2/d) 1323 (42.7/d) 20080229-20:06-GMT to 20080331-18:36-GMT (31d) Import meter unratcheted, so reading of 117kWh shown with 70kWh of the PV generation added back on. PV generation logs (.csv). Replacement of fridge/freezer with A+ model reduced electricity consumption by ~1kWh/day. HDD12=157. 2008/04 165 (5.5/d) -108 (-3.6/d) 882 (29.4/d) 20080331-18:36-GMT to 20080430-20:21-GMT (30d) Import meter unratcheted, so reading of 57kWh shown with 108kWh of the PV generation added back on. PV generation logs (.csv). HDD12=105. 2008/05 146 (4.7/d) -135 (-4.4/d) 290 (9.3/d) 20080430-20:21-GMT to 20080531-19:18-GMT (31d) Import meter unratcheted, so reading of 11kWh shown with 135kWh of the PV generation added back on. PV generation logs (.csv). HDD12=22. The central heating was turned off 2008/05/14. 2008/06 146 (4.9/d) -160 (-5.3/d) 264 (8.8/d) 20080531-19:18-GMT to 20080630-20:05-GMT (30d) Import meter unratcheted, so reading of -14kWh shown with 160kWh of the PV generation added back on. PV generation logs (.csv). HDD12=6. I estimate that our gas use for DHW is now a little over 6kWh/day. Cooking is the only other use at this time of year. The electricity bill for the first six months of the year was just over £80, even on the premium 'all renewables' tariff. 2008/07 139 (4.5/d) -161 (-5.2/d) 204 (6.6/d) 20080630-20:05-GMT to 20080731-23:59-GMT approx (31d) Import meter unratcheted, so reading of -22kWh shown with 161kWh of the PV generation added back on. PV generation logs (.csv). HDD12=3. Not present to take reading due to holiday, so estimated by subtracting 4kWh from the import and 6.5kWh from the PV generation readings of 20080802-13:30-GMT (no gas was used at all while we were away). 2008/08 147 (4.7/d) -104 (-3.3/d) 230 (7.4/d) 20080731-23:59-GMT to 20080901-06:48-GMT (31d) Import meter unratcheted, so reading of ~44kWh shown with ~104kWh of the PV generation added back on. PV generation logs (.csv). HDD12=1. Adjustments for end-of-July reading taken into account. 2008/09 152 (5.1/d) -85 (-2.8/d) 271 (9.0/d) 20080901-06:48-GMT to 20080930-17:28-GMT (30d) Import meter unratcheted, so reading of ~67kWh shown with ~85kWh of the PV generation added back on. PV generation logs (.csv). HDD12=11. Electricity bill for Jul/Aug/Sep just over £15 and <1kWh/day net! 2008/10 160 (5.2/d) -53 (-1.7/d) 529 (17/d) 20080930-17:28-GMT to 20081031-19:47-GMT (31d) Import meter unratcheted, so reading of ~107kWh shown with ~53kWh of the PV generation added back on. PV generation logs (.csv). HDD12=83, cf HDD12=53 last year, with heat demand 17kWh/day vs 20kWh/day last year, which implies nearly doubled space heating efficiency. Heating turned on this (fairly chilly) month, and we had had a couple of thermostatic radiator valves (TRV) fitted ready, with more due next month. The boiler broke down shortly after its service, so heating was erratic for a while. 2008/11 191 (6.4/d) -18 (-0.57/d) 828 (28/d) 20081031-19:47-GMT to 20081130-18:30-GMT (30d) Import meter unratcheted, so reading of ~173kWh shown with ~18kWh of the PV generation added back on. PV generation logs (.csv). HDD12=128, cf HDD12=134 last year, with heat demand 28kWh/day vs 43kWh/day last year, again implying significantly improved efficiency. 2008/12 210 (6.8/d) -17 (-0.54/d) 1194 (39/d) 20081130-18:30-GMT to 20081231-18:09-GMT (31d) Import meter unratcheted, so reading of ~194kWh shown with ~18kWh of the PV generation added back on. PV generation logs (.csv). HDD12=233, cf HDD12=192 last year, with heat demand ~39kWh/day vs ~53kWh/day last year, and never over 60kWh/day. We managed to meet our gas (heating energy) budget for the winter taking us up to <8.9MWh for the year. The electricity bill to the end of this month was a little over £70, so ~£170 for the year, even at a premium 'green' rate, and the gas bill ~£280 to the year end: in total less than half the 'typical' £1000+. 2008 total (Jan--Dec) 2036 (5.6/d) -901 (-2.9/d) 8883 (24/d) 20071231-20:38-GMT to 20081231-18:09-GMT (366d) 1.29kWp grid-tied solar PV system operational from 2008/02/27, ie 57.5d after year start. See the daily PV generation logs for 2008 as .csv and chart. HDD12 for the year totals 1061.
kgCO2 875kg (2.4/d) -387kg (-1.1/d) 1688kg (4.6/d) ~2.2tCO2 (~5.9kgCO2/d) gas/electricity emissions total for 3 people (4 from mid-November), or about 2/3rds reduction for the household from only a year or two ago, based on 0.43kgCO2/kWh for electricity (netted) and 0.19kgCO2/kWh for gas. This SAP energy performance certificate computed 2009/03 estimates 1.9tCO2. Note that we haven't flown this year (nor indeed for some years), we don't own a car and travel almost entirely by (usually-electrified) public transport (we drove ~80 miles in a hire/rental car in 2008). First published 2008-01-01 , updated 2019-04-22 . Site copyright © 2007-2019 Damon Hart-Davis. Hosted by ExNet.